Moe Nadal of Meanderware knows a thing or two about grinding. When he first decided to make the switch from photography to craftsmanship, he had his girlfriend teach him to sew with a needle and monofilament. Still too broke to afford top-notch materials - he'd go to fabric stores around the city and dig through dumpsters - getting the best goods he could. From there - his first round of wallets and bags were born (Re-use is one of the 3 factors of Recycling right? Reduce Reuse Recycle? Ok -this post is getting a green tag too!). Enter 2011 - and he's no longer digging through dumpsters for fabric or working side hustles doing zipper repairs. 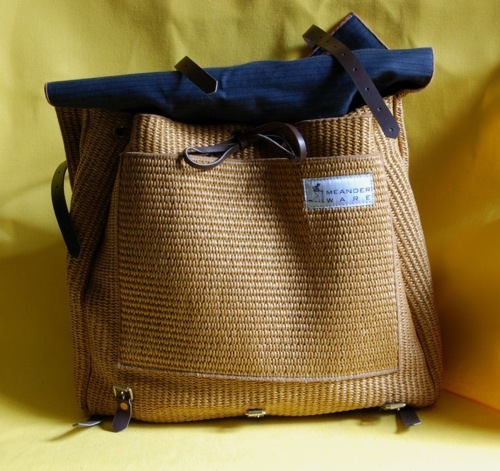 He continues to invest in himself - using profits from past sales to obtain the most quality products available - with the goal of creating individual bags that can be passed down from generation to generation. Currently - his pieces are available via appointment only, (meanderware@gmail.com) , and you can check out the bags available for sale here. Support the independents!